Bob and Rick start with the Box of Hearts. 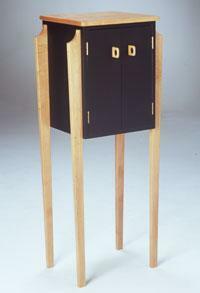 The Secretary is completed in four parts, the desk component can be used as a stand alone project. 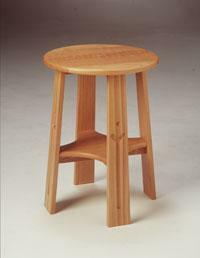 The Wedge Stool complete with a dip angle top which adds comfort and a carrying handle. Next up the Pediment Mirror which uses pattern work and turning tips followed by the Stilt Cabinet a truly modern and unique piece of furniture. The Dresser Case uses decorative molding bits, an attractive inlay on the lid complete with brass feet, a perfect gift for small treasures. 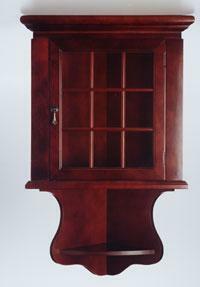 The Corner Hutch with adjustable shelves will display many special trinkets. Finally the Mission Table with unique designs on the wide legs adds character to this piece which can be used as an Oak Table or Bar Stool. Paduk and ash woods compliment one another in this Box of Hearts. Box corners and a front splice fasten the box together with heart joinery that is decorative and strong. Further decoration is provided with a heart inlay in the lid. In this episode (#1001) of the Router Workshop, Bob and Rick use contrasting woods for the unique Box of Hearts. Bob and Rick rout pattern pieces to produce a stool that is comfortable to sit on or rest your feet on. The dip angle top adds comfort and the carrying handle is handy and practical. The rounded ends make sturdy legs and wedges hold the rail in place. 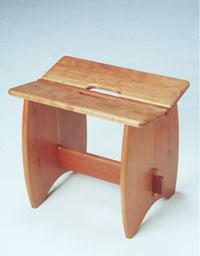 This is the Wedge Stool on episode #1006 of the Router Workshop. 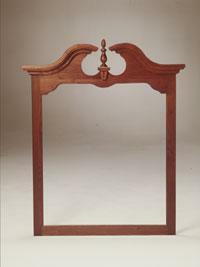 Layout, pattern work and turning tips are important parts of this decorative Walnut mirror frame. Rick and Bob explain these in Part 1 of The Pediment Mirror, Episode #1007. The curved decorative pediment utilizes meticulous layout and bit choices to produce the pleasing crown of the Pediment Mirror. Follow the fascinating steps shown by Bob and Rick Rosendahl in part 2, Episode #1008 of the Router Workshop. Professional woodworkers, Rick and Bob Rosendahl produce a modern black cabinet on stilt legs in episode #1009 of the Router Workshop. 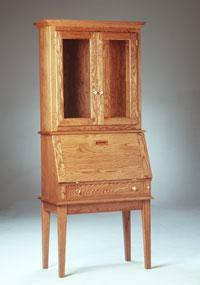 Clear Maple top, pulls and legs offset the black box like cabinet that features an adjustable shelf. Follow the step by step directions for a truly modern and unique piece of furniture. This Dresser Case allows us to take advantage of the many decorative molding bits available to router woodworkers today. Choose a bit with a pleasing mold and use thick case sides to produce the outside shape in one easy pass. A geometric glued up lid with or without a contrasting inlaid band is used on top the Oak case. Finish with screw-on brass feet. All this is completed in episode #1010 of the Router Workshop. This is the ideal piece to furnish that 90-degree corner. The experts, Bob and Rick Rosendahl show how to pattern cut the sides, install the bottom and top, make the facing and drill adjustable shelf holes in part 1, episode #1011 of the Corner Hutch in the Router Workshop TV program. In Part 2, episode #1012, the hosts show how to produce a mutton bar door, two inside triangular shelves and install the lower outside shelf. All this is the two-part project, the Corner Hutch.